Jon Snow, Donald Glover and Bear Grylls, oh my! In addition to performing at Coachella this week and partnering up with Google on a Pixel 3 campaign, Childish Gambino (Donald Glover) has also released a new thriller film called Guava Island. The special follows a local musician who’s determined to throw a festival. Guava Island was directed by Hiro Murai (Atlanta) and stars Donald Glover (Atlanta), Rihanna (Ocean’s 8) and Letitia Wright (Black Panther). Amazon Prime Video release date: Following its April 11th premiere at the festival, Guava Island will be available to everyone through Amazon.com starting April 13th at 3:01am EST. The film will be free for all until 9pm EST, at which time it will become exclusive to Amazon Prime Video. The full list of movies and shows streaming on Amazon Prime Video Canada in April can be found here. Spike Lee’s Oscar-winning biographical crime film about the Ku Klux Klan is now available on Crave. BlacKKKlansman follows Colorado Springs’ first African-American detective as he infiltrates the KKK during the 1970s. The film stars John David Washington (Ballers), Adam Driver (Star Wars: The Last Jedi), Laura Harrier (Spider-Man: Homecoming) and Topher Grace (That ’70s Show). Note that BlacKKKlansman requires Crave’s Movies + HBO subscription, which costs an additional $9.99/month on top of Crave’s flat $9.99 monthly fee. 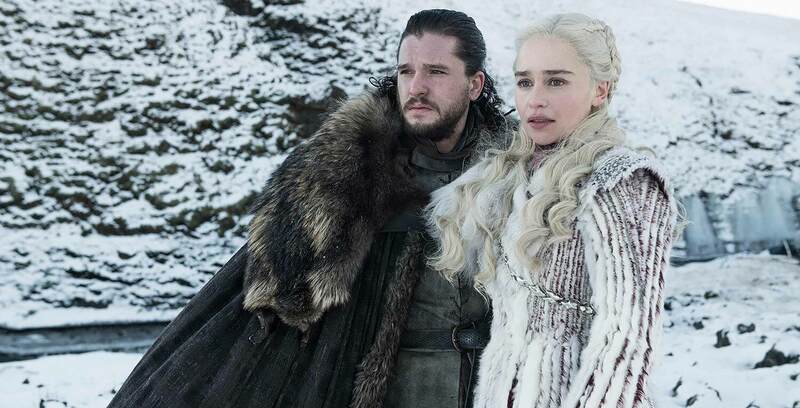 The highly anticipated eighth and final season of Game of Thrones hits Crave on Sunday, April 14th at 9pm ET/6pm PT — the same time that it airs on HBO. The remaining five episodes will hit Crave each Sunday for the next five weeks. Find out who survives the long-running epic conflict. Game of Thrones stars Kit Harington (War Horse), Emilia Clarke (Solo: A Star Wars Story), Nikolaj Coster-Waldau (Black Hawk Down), Peter Dinklage (Three Billboards Outside Ebbing, Missouri), Lena Headey (Fighting With My Family), Sophie Turner (X-Men: Dark Phoenix) and Maisie Williams (Doctor Who). Note that Game of Thrones requires Crave’s Movies + HBO subscription, which costs an additional $9.99/month on top of Crave’s flat $9.99 monthly fee. A full breakdown of how to watch Game of Thrones on Crave can be found here. The full list of movies and shows coming to Crave in April can be found here. Netflix’s latest Original film, The Perfect Date, stars To All The Boys I’ve Loved Before heartthrob Noah Centineo as a high schooler who launches an app offering his services as a fake date, only to find himself developing real romantic feelings. The film was directed by Chris Nelson (My Dead Ex) and co-stars Laura Marano (Austin & Ally) and Camila Mendes (Riverdale). You vs. Wild is Netflix’s newest choose-your-own-adventure experiment, following last December’s Black Mirror: Bandersnatch. The interactive series tasks viewers with making decisions to help Bear Grylls (Man vs. Wild) survive in the wilderness. Just be aware that you can’t actually kill him. The full list of movies and shows hitting Netflix Canada in April can be found here. Are you excited for the beginning of the end of Game of Thrones? Are you looking forward to a new film from Childish Gambino? Let us know in the comments.